Other names: Sansaru, siaru, tussara, tussiari. 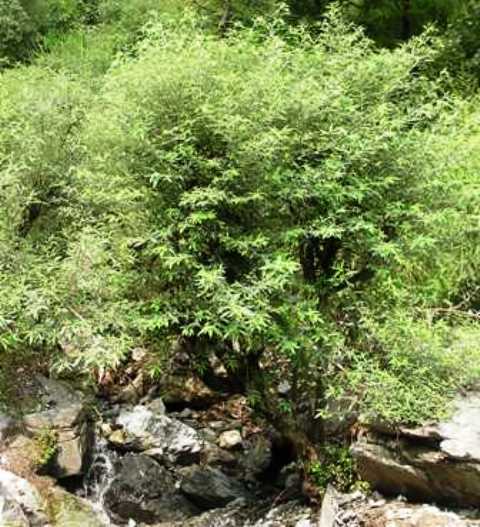 Sahyaru is a wild growing tree occurring in ravines and shady forests of the of the Western Himalayas from Kashmir to Kumaon at altitudes of 3000 – 5000 ft.
A large shrub or small tree, softly pubescent, upto 3 m high. Leaves alternate, short stalked, broadly or narrowly lanceolate, 7-17 cm, long pointed, base 3-nervd; teeth numerous, regular sharp; upper surface rough, lower white tomentose; stipules 2-parted. Flowers unisexual, interspersed with numerous bracteoles, in rounded, sessile, axillary clusters; male and female flowers on different plants; male flowers with tomentose perianth, 4-parted,; stamens 4; female flowers with tubular perianth, narrowed to a minute, 4 toothed mouth, more or less adnate to the enclosed ovary; stigma resembling a sessile tuft of hairs. Fruit a drupe, small, yellow to rusty orange, aggregated in a head. The fruits are edible. These taste sweet with a pleasant bend of acid. The pulp is somewhat dry but tastes pleasant. The fruits are just eaten by local people and are not traded. A fibre is extracted from the bark like hemp. This fibre is used for making ropes. The leaves are eaten by goat. Sahyaru grows in wild only. It also does not figure in the domestication programme of any agency in India. So nothing is known about its propagation. 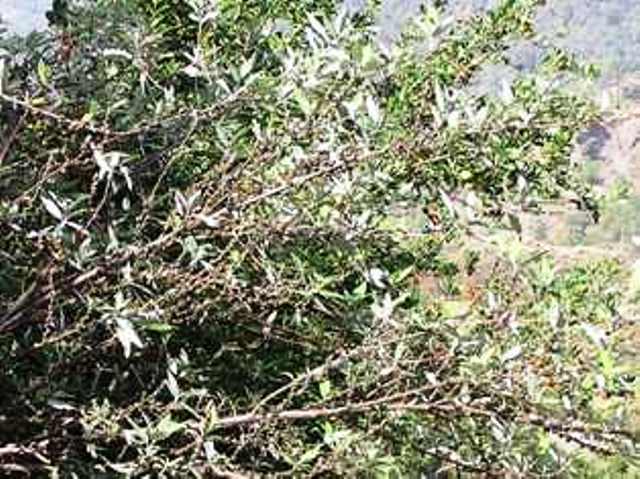 As Sahyaru is a useful multipurpose tree, so it should be domesticated. Prefers a fertile well-drained loam with some shelter at the hottest part of the day. 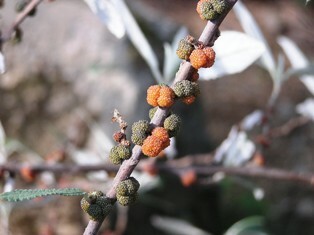 Plants tolerate occasional lows to about -5°c. This species is probably not very hardy in Britain and will probably require greenhouse protection, though it might be possible to grow it outdoors in the mildest areas of the country, especially if it is given the protection of a warm wall. Seed – sow late winter to mid-summer in a greenhouse and only just cover the seed. Germination usually takes place within 1 – 2 months at 20°c. When they are large enough to handle, prick the seedlings out into individual pots and grow them on in the greenhouse for at least their first winter. Plant them out into their permanent positions in late spring or early summer, after the last expected frosts.